Niagara's new Eco-IQ Programmable Thermostat is programmed using Energy Star guidelines that can help keep a home cool in the summer and warm in the winter for much less. The average household spends more than $2,200 a year on energy bills - nearly half of which goes to heating and cooling. By properly configuring your thermostat and maintaining its settings, a homeowner can save up to $180 annually. 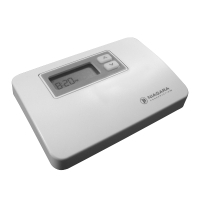 The Eco-IQ is easily programmable and features separate programs for heating and cooling, weekday and weekend programming, and a 30-day vacation mode. The screen provides a clear liquid crystal display and backlit keys and glow and the dark buttons for nighttime operation. Where can I get a copy of the operating manual for this product? I had it installed last year and have lost mine.